The TomTom Multi-Sport is a surprisingly striking GPS watch. The face is a flat square (a mere 11.5mm thick) shape, which sits neatly on your wrist. Made of the same perforated plastic which is the norm with sports watches. It’s a tried and tested format which works well, providing a comfortable wearing experience without being detrimental to the workout. The watch features a ‘high resolution’ screen – whilst unlikely to rival your favourite HD displays – it does provide an element of quality which is a definite cut above rival sports watches, especially those produced by Garmin. Sports watches still generally sport very primitive displays, often in monochrome, lending them a slightly outdated feel and also rendering them near useless in the dark. This is a real problem for me, because the gym I frequent, a GymBox chain in Farringdon, London, is an especially dingy gum, being underground. This display therefore provides more value for the user in all conditions, and wins itself a big tick. The figures are easy to see, in large enough font to catch the eye at a glance. 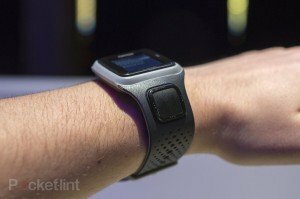 However, scree scrolling is manual and the TomTom Multi-Sport thus lacks the hands free technology popularised by Polar (raise the device towards the heart rate strap to scroll). That’s no drama on a bike ride but a pretty big problem is you’re a swimmer and an inconvenience if you’re a runner. That said, the device is controllable by a flat tracker directional tracker pad (pictured on the strap, by the watch face). The claim that this makes the device ‘one button control’ is false, but in truth it is better that it isn’t. I feel that this is a case of marketing men missing the point – serious athletes like the idea of being able to quickly navigate to the exact screen that they want. I really like how I can filter backwards and forwards through the menu with this feature, which eliminates the often clunky button on each corner of the face, which is popular with all other GPS watches. An interesting design quirk is that the device can detach from its shell, allowing you to add different coloured attachments. This watch is very safe from a design point of view, compared to the lively coloured devices which have become the fitness technology norm. So this is a nice subtle way of allowing the device to stay the pace with the competition and current trend whilst giving it a default higher end feel. This quirk is nice for the cleaning of the Multi-Sport too, as you can really give it a good spit and a polish post workout. Final point on design – the Multi-Sport is a seriously light 50g. That puts it into the weight band of devices like the Nike Fuelband, which is quite the achievement for a device with a full screen. As mentioned, the flat tracker allows for simple watch navigation, allowing you to effortlessly flick your way through the different screens. This navigation is nicely augmented by a graphical display feature, which can quickly indicate the percentage completion of your workout (measured against goals like time, distance and calories) or other features, such as the ghost runner. The ghost runner allows you to run against yourself in a personal race. 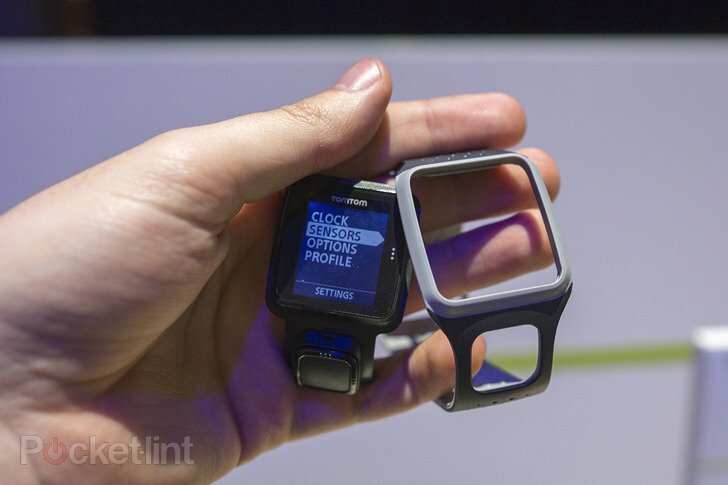 It’s a feature that I particularly like on Garmin devices (Virtual partner), as it incites personal competition. It’s great if you train alone, as it can provide just the kick you need to really push yourself when the going gets tough. Additionally, the devices have a backlight which is easily activated by tapping the right hand side of the screen. This, again, saves the hassle of trying to locate a button on a corner of a screen whilst running fast. The downside is that you end up splattering the screen with sweaty finger prints, which can disrupt the viewing of the screen. Definitely not a major drawback, but the sort of small mistake that you might associate with a sat nav company having a go at a totally different consumer technology vertical? TomTom claim that the battery is good for 10 hours. In testing, I played around with the Multi-Sport for around 3 hours and was left with ~70% battery, indicating that this is a pretty strong estimate. The TomTom Runner includes a heart-rate monitor which ties around the chest, while the Multi-Sport has both a heart rate strap and a cadence monitor for cycling. The Multi-Sport also includes a an in-built altimeter which delivers greater accuracy and more data sround climbing and swimming. You can also purchase a bike mount in order to attach the Multi-Sport to your kikes handlebars. One brilliant, forward thinking move by TomTom is the fact that they have opened their software up to all platforms, not just the TomTom MySports website. Avid users of applications like MapMyFitness, RunKeeper, TrainingPeaks and MyFitnessPal will be able to integrate these services with their Multi-Sport, as all are compatible with both devices. Price depending, this could be a sealer for me, as readers of BurnTech.tv will know that I am a big proponent of ‘social fitness’. I think the more open minded and platform agnostic manufactures can be, the better. Social fitness lets people compete with friends to hit their goals, building competition and a group fitness mentality. It’s here to stay, and forward thinkers like TomTom seem to acknowledge that.